Customized magic – Make your next event an amazing success. Presentation Skills: The Q&A of a presentation often stokes fear in seasoned public speakers. Of all possible presentation elements – opening, stories, demonstrations, closing – the Q&A has the tendency to make even well versed speakers lose control and fall flat. As it’s usually near the end of the presentation, a poorly handled Q&A session leaves the audience with a negative impression of the presenter’s message. Don’t let this happen to you. One common fear that causes many presenters to dread the Q&A session is the fear of unknown questions. This fear, like most, is unfounded as the reality is that the presenter controls of the situation. The audience can ask any question, but the presenter chooses how to respond. In general your answers should be brief and direct. Your responses should not be mini presentations. 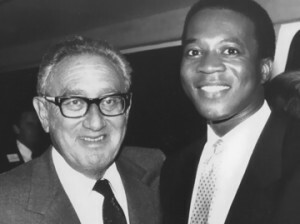 Former Secretary of State Henry Kissinger would begin his press conferences: “Does anyone have any questions for my answers?” As Dr. Kissinger’s quote suggests, be prepared with your answers in advance of their questions. 1) Don’t end your presentation with Q&A. Although most presentations end with the Q&A, superior speakers don’t. Ending with Q&A might mean having to respond to a question that drags you on a tangent away from your main message. The better strategy is to follow your Q&A session with a short closing that recaps your main message points. Regardless of the last question asked, ending the Q&A with a brief recap will redirect attention back to you. This means that the last impression will be your message. You get the final word. 2) Know the top ten questions of your audience. Regardless of your subject matter your audience will only ask a small range of questions in relation to your information. To find these questions out in advance, meet attendees before your presentation and ask them their top concerns about your information. The same questions, usually 8 – 10, will come up again and again as you present to different audiences. Learn the standard questions to your presentation information. 3) Prepare fifteen responses to the “top ten” questions. Create a variety of ways to respond to your audience’s standard questions. This will give you flexibility in how you answer. As you learn your audience’s primary questions, prepare responses that are brief and direct. Practice your delivery because how you answer a question is as important as what you say. 4) Repeat the question. Repeating the question ensures that everyone hears it. One technique of professional presenters is to restate the question to get to the core issue. This requires that you listen to the question, summarize it and then verify that your restatement addresses the questioner’s central concern. This technique allows you to strip away the extraneous parts of a question and go right to the heart of the inquiry. 5) Acknowledge when you don’t know the answer. Yes, at some point you’ll receive a question to which you don’t know the answer. It’s okay. Just don’t fake an answer. You’ll lose credibility if you evade the question or fake a response. First, acknowledge that you don’t have an answer. Second, promise the questioner a follow-up response at a later time. You could also address the question to the audience for an immediate answer. As long as you’ve done well with the rest of your presentation, asking for assistance from the audience will display your confidence to handle the situation. Your Q&A, like the other elements of your presentation, should be well practiced. Familiarity with your subject and audience will give you opportunities to learn the “top ten” standard questions in advance and prepare the best responses. Apply the above information and fear not the raised hand. In a short time, like Dr. Kissinger, you’ll have the answers even before they know the questions. To receive weekly tips on presentations skills, connect with Charles Greene III on LinkedIn or Twitter (@CharlesGreene3). For his archive of presentations tips, visit his weekly presentation tips page. 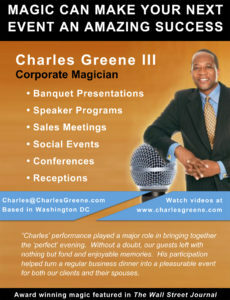 Charles Greene III is a true Presentation Magician. Working with Fortune 500 companies, he’s a magical spokesperson who delivers product and marketing messages at conferences around the globe. Through his company Corporate Shuffle, Charles has presented at meetings in Bermuda, China, Egypt, France, Mexico, Monaco, Sweden, and, of course, the United States. His clients span a variety of industries and include 3M, Alcon, Coca-Cola, Clorox, Frito-Lay, Johnson & Johnson, Panasonic, and Wells Fargo. Charles’ public speaking and presentation workshops are engaging, educational, and empowering. With more than 25 years of experience as an international corporate spokesperson, Charles leads by example. He captivates attention as he delivers critical presentation skills. His workshops cover the core skills of public speaking as well as presentation techniques learned from decades of corporate presenting. Charles is a guest columnist for Presentation Magazine. He’s been featured in Discover, The Washington Post, The Wall Street Journal, and The Robb Report. When not for revealing the secrets of better public speaking, Charles spends time collecting vintage magic posters, stone lithographs of magicians from 1890 – 1930. To see some of his collection, visit www.MagicPosterGallery.com. He can also make a mean gumbo. Charles was born in Hackensack, NJ. He currently lives in the historic Columbia Heights neighborhood of Washington, DC. This entry was posted in Public speaking and presentation skills and tagged Audience, Henry Kissinger, Presentation magician, presentation skills coaching, presentation skills training, public speaking, Q&A sessions, Washington DC. Bookmark the permalink.